Rich, flawed and female, Louise Marshall was an unconventional hero. She neither sought nor received medals, but she saved hundreds of people from certain ruin and changed tens of thousands more lives for the better. Some people compare her to Jane Addams, who founded Chicago's famous Hull House and traveled the world promoting great causes of the Progressive Movement. 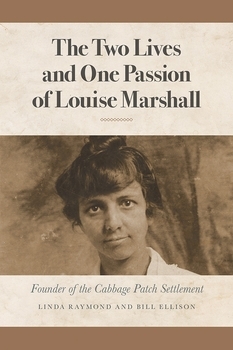 Miss Marshall focused her life on one Louisville, Kentucky neighborhood, known as the Cabbage Patch, and the individuals who lived there. For 70 years, she used love, not legislation, to foster pride, self-respect, and character in people who loved, admired, and hated her — often at the same time. Powered by a conservative faith, Louise Marshall built an institution, the Cabbage Patch Settlement, which still uses her methods to attack today's most difficult social problems. And she still offers us lessons in courage and the power of one unlikely hero to change and save lives. Linda Raymond and Bill Ellison are retired journalists with a strong interest in history. After retiring from long careers at the Courier-Journal and Louisville Times, they pursued their interest in history, and Raymond taught writing for 15 years at Bellarmine University and other Louisville-area colleges. Together they wrote Like Jacob's Well: The Very Human History of Highland Presbyterian Church, which won the Angell Award for best first book by Presbyterian writers.